I love finding wines like these. 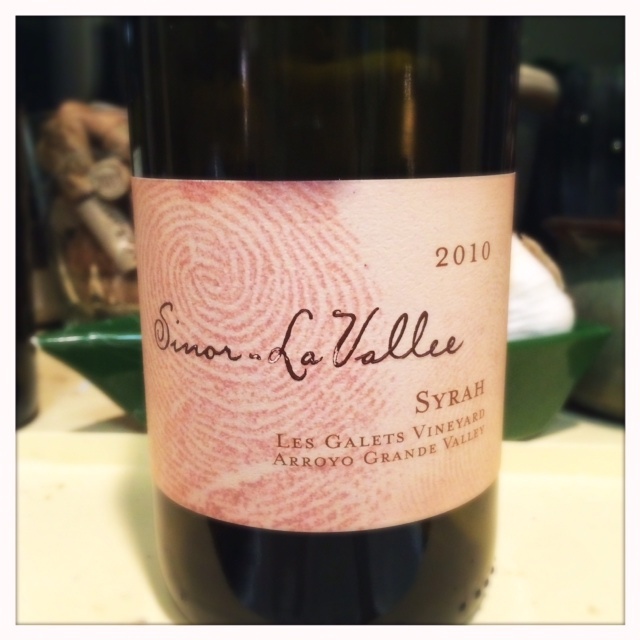 An under appreciated variety from a little known region, this 2010 Arroyo Grande Valley Syrah is a delicious wine with outstanding Syrah varietal qualities, and all for under $30. I’ve had some Syrah from Arroyo Grande before at Laetitia Vineyards. They were okay but didn’t really express that cool-climate structure and acidity that I think really good Syrah should have. On my last trip to Laetitia I found that part of the reason for that is that they were blending their grapes with fruit from warmer climes, almost as if they were afraid to let those cool-climate characteristics come forth. Well, here’s a wine that isn’t afraid. It’s got cool-climate character for days and I’m in love. On the nose there’s a mushroom and olive tapenade quality to Les Galets, mixed with aromas of fresh strawberries, raspberries and plums. I know that sounds like a strange combination of aromas but it actually smells delicious. It’s light on the palate but transitions to a pretty tannic finish. I’d like the finish to be a little less tannic but the wine still works and with some age I think it will get even better. There’s a core of sweet, red fruit but without the jammy quality that one finds in many Syrahs from the southern region. Les Galets grapes are grown less than six miles from the ocean. I think that, and the conviction of the winemaker to let the wine speak for itself, helps to set it apart from much of the Syrah grown along the Central Coast. Picked at 22.5 brix, this is a grape that many winemakers might mix with fruit grown in warmer vineyards to dial back the acidity but Mike Sinor let the vineyard come through in all it’s cool-climate glory. I look forward to trying more wines from Sinor~La Vallee, it’s definitely a region that should garner more attention than it does. Anyone want to finance a new vineyard planting? 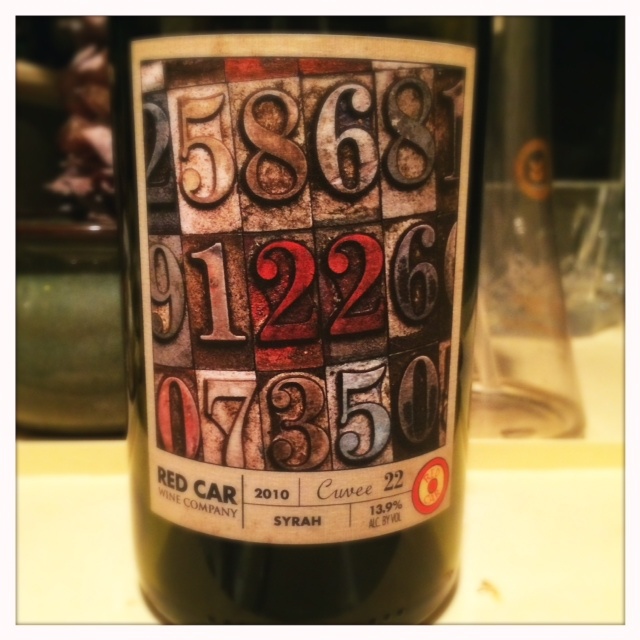 Red Car is a great California winery that doesn’t get nearly the attention that it should. I admit it flew under the radar for me for a while and it might have something to do with a name that for me suggests a less than premium label. But this is premium wine. Having tried Red Car at a the West of West wine event I was immediately convinced that this was a winery I needed to get to know better. In fact, these are some of the best Syrahs and Pinots from the Sonoma Coast that I’ve ever tasted and that says a lot considering there’s a growing cadre of serious contenders. My wife and I made the trip up to Red Car on our way to Anderson Valley about a month ago. The tasting room is a fun place, with a style that evokes urban hipness as opposed to country kitsch. 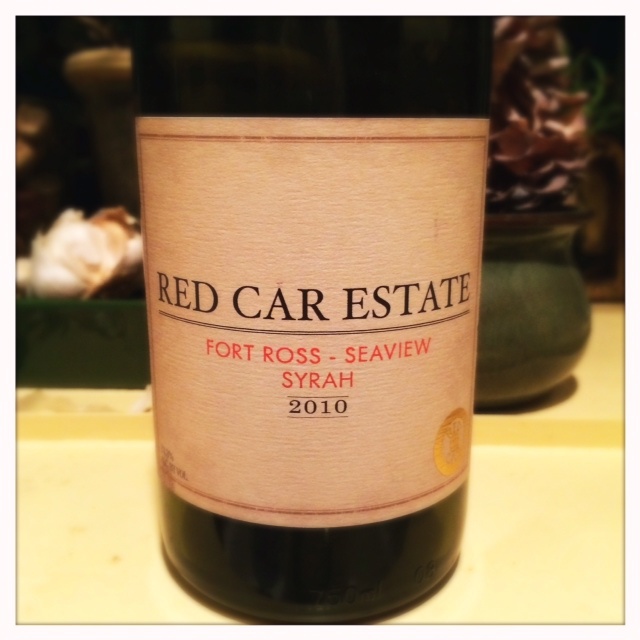 The 2010 Fort Ross Seaview Syrah: Wow, this is a great wine. On the nose I get savory components of olive tapenade and bitter chocolate, there’s also an umami element that makes me think of soy sauce. There are some fruit aromas of fresh blackberry combined with an earthiness that carries over onto a bright midpalate that evokes less than ripe fruit. The finish isn’t too tannic but has some good acidity. If you’ve been reading my blog for bit, you already know that this is my type of wine. I had this blind at the Syrah tasting at the WOW event and was blown away there also. 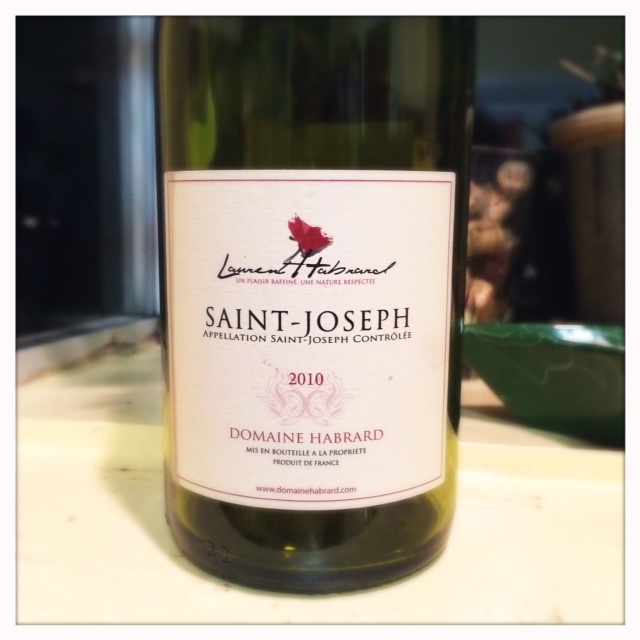 I had pegged it then as a wine from St. Joseph because of that bright acidity and lack of harsh tannin. The Cuvee 22 is definitely a bigger style of Syrah but not too big. At 13.9 % alcohol it’s still squarely in the cool-climate camp, at least for California. There’s a little less fresh fruit on the nose and it leans more towards a blackberry blueberry compote. Not jammy by any means, just a tad more ripe. I get some licorice and tobacco mixed in with that fruit. Just like the Seaview, this Syrah is light on the tannins. It’s got great acidity but is drinkable now. Almost too drinkable; it’s making it difficult for me to save some to taste tomorrow. It says a lot when a winery can do two Syrahs that are so stylistically different and so damn good. Both of these wines are balanced for their style of wine. One is more on the brighter cooler climate style, the other a little more brawny style but both with nice balance. Red Car’s winemaker Carroll Kemp is an old hand at Syrah having made it over ten years ago as his first foray into winemaking when he lived in Southern California. Back then, he made (and appreciated) a bigger, more extracted version of the grape but as his palate developed it began to draw him closer to the cooler climate vineyards of north western Sonoma County. Most of my conversations with winemakers who make wine in the New World usually come back to France. Most of the winemakers who make a cooler-climate of Syrah don’t do it for economic reasons but rather because they respect the grape in its earliest iteration from the Northern Rhone. One conversation about Syrah from the Northern Rhone with Steve Law from MacLaren Wines left me wanting to get to know Saint Joseph better. Steve kept talking about his favorite wines from that region and how they were so light in tannin and could go so well with all types of food, even fish. Since that conversation, I’ve had a few St. Josephs, but they always seemed to have a big punch of tannins at the end. I hadn’t found one yet that really represented what Steve was talking about. Well, now I have. The Domain Habrard Syrah is very low in tannin but has a great acidity that makes it food friendly. This wine has a nose of dust, flowers, and olive tapenade. The mid-palate is full with a backbone of acidity. There’s acidity on the finish but lighter tannins that make it a great pairing for chicken and even some rich fish dishes. Domain Habrard is an organically farmed estate with one of those long histories of grape growing that goes back for hundreds of years. The latest caretaker of the estate is Laurent Habrard, who’s been responsible for the transition to organic farming. This would be a great wine to try for those of you who are willing to get out of the “Syrah with barbeque” paradigm that’s being propagated by most of the wine literati out there.